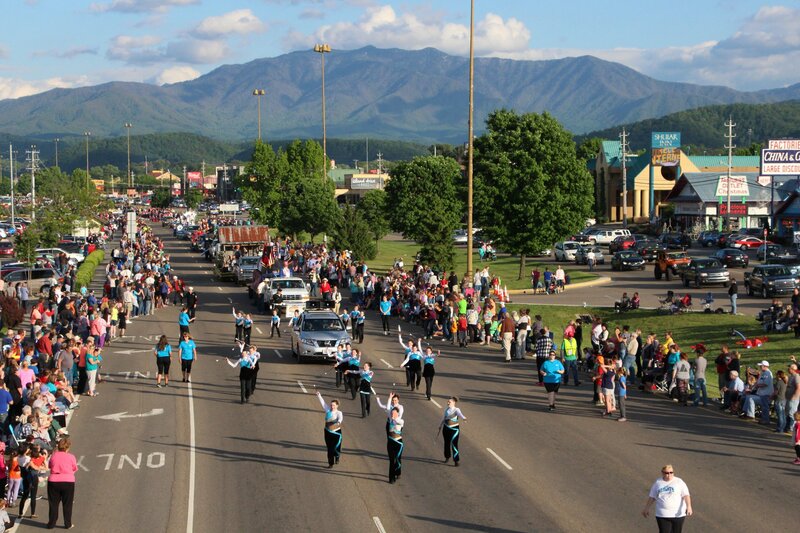 This is a fun parade to welcome the merry month of May, and this year the parade welcomes a number of high school marching bands showing their talent, along with dance and song groups, and of course baton twirlers, from Tennessee and neighboring states. It’s also a great chance to view samples of the shows performed by the many excellent theaters and attractions in Pigeon Forge. All the usual suspects of a good parade will appear, with celebrities, costumed characters, colorful floats and prancing horses. New additions to the parade will include some large balloons in the form of popular characters. Bluegrass fills the air as Friday evening offers a free show at The Island, and Saturday offers a free show at the Old Mill. There are usually well over 100 floats in the parade, which can draw up to 50,000 spectators lining the sidewalks and lawns of Parkway. Traffic will be congested as the northbound half of Parkway closes for the parade. There’s parking everywhere but getting around can be tricky. Veterans Boulevard and Teaster Lane are good alternative roads that locals use when Parkway jams up. As with every parade, getting there early is always the best advice to find a great spot to watch. Light #6 is roughly the center of town, with Patriot Park to the south, while light #3 to the north is close to The Island. Checking a map and planning your parking and walking is a good idea. The changes this year present a new beginning for the parade. For 32 years, Dolly Parton was grand marshal, and the parade took on her name as her Homecoming Parade. She now says it’s time to step down and let other attractions get a little more exposure without being in the shadow of Dollywood. Cal Ripken, Jr is a National Baseball Hall of Famer and also an inspiring figure in Pigeon Forge. He created a multi-million dollar, multi-field baseball facility for young people, the Ripken Experience Pigeon Forge, which has hosted hundreds of teams, and he mentors local youth and serves as a role model and inspiration. And if you’re looking for accommodation in the area, check out our Pigeon Forge cabin rentals and Gatlinburg cabins. We have lots of pet friendly cabins in Pigeon Forge too, and each cabin comes with our Trip Cash complementary book of Pigeon Forge coupons – free tickets to great attractions in the area, worth over $400 !